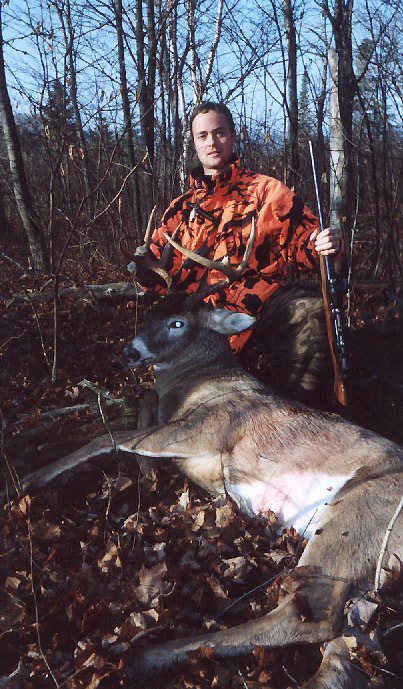 It was the final weekend of rifle season for whitetails in Minnesota. The night before, I decided to relocate from one side of a ridge to the other. It just seemed pretty quiet where I used to be and I went in search of better buck sign. I found a nice spot, deep in the woods between a swamp area and the ridge. I basically set up Friday night in the dark, not really having a chance to sit during the golden hour of nightfall. Early the next morning, I headed out there. I arrived in my tree stand and immediately heard a loud crashing behind me; a big cow moose came bellowing through the area. At one point she was within 150 yards of me. I hoped to see the bull, but also wondered if I set up too close to the swamp. She eventually lumbered off. The morning paused for awhile, in slow motion, waiting for the sun to break over the ridge. A heavy fog was beginning to lift. When the light finally poured in, the columns of fog were brilliant. Just then a doe trotted down the trail I was hunting over - like out of a wildlife painting. She came from the edge of the swamp. I was already standing, enjoying the morning. I slowly arranged my rifle on my shooting brace, just in case. White spruce are the best for shooting braces. The doe stopped about 20 yards from me on the trail and tried to smell the area. The wind was perfect. She was uneasy, but never saw me. It would’ve been a perfect bow-hunting opportunity. She was really hesitating, sniffing the air intently. Then I heard a very low, guttural series of grunts coming from further down the trail in the direction of the swamp. Much lower than any deer call I’ve ever heard: a dominant buck. The doe sat tight for a bit. I then caught a glimpse of motion while looking in the direction of the grunts. As he neared, I distinguished a rack though the heavy cover. To be honest, all I saw was a few tines, just enough to determine that he was a buck. I then shifted all focus to his body: the vitals - looking for a shot. The doe became anxious and started to quicken her pace, angling away from me. I was very cautious about any movement - if she bolts, this buck is gone! I was already looking through my scope, waiting for him to emerge. After only a few steps out of the cover, he stopped grunting, turned instantly and began to make a swift exit. I scoped him up and squeezed a shot off. He was moving fast and all I had was the back of his neck. Smoke from the shot hung in the heavy air. His tail flashed and he weaved through the brush; he was hit. Instead of continuing to run, he turned and stopped, hoping to use his most powerful defense: his senses, to determine where the danger was before high tailing it out of there. In doing so, he gave me a nice broadside shot. I didn’t hesitate. 85 yards, mild brush, in the vitals. He stumbled ten yards and fell over. I looked at him through the binoculars and then began to understand how big he really was. I knew I’d like to put him on a scale at some point. He ended up weighing in at 226 lbs. with 17 6/8” spread and 10 inch G2’s. 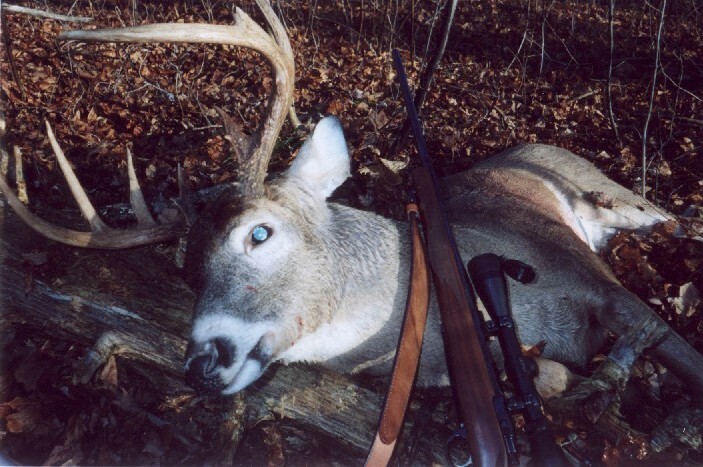 He had nice gnarly brow tines and main beam tines beginning to palmate. Excellent genetics. A real burly, stoic looking buck, too. Stinky as hell. 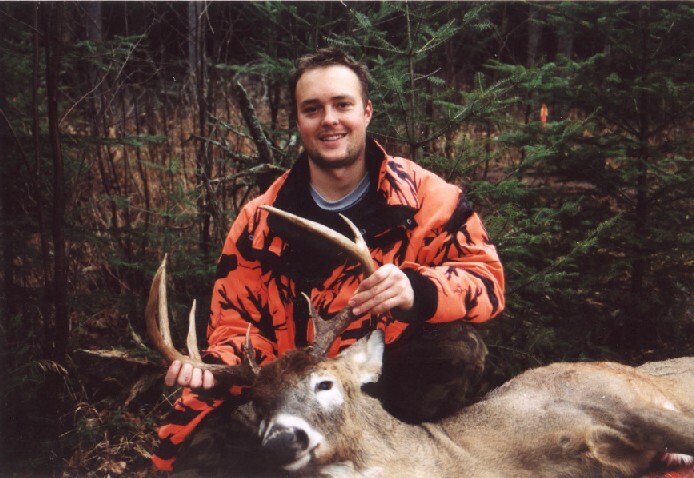 (I took him in to Buck's Hardware in Grand Marais, the Big Buck Contest Headquarters. Note: the biggest buck was 259 lbs and the biggest spread was 23 inches - two different deer.) He was a monster, my biggest deer, both rack and weight to date. Had it not been for the busted tine, he’d a been a wall-hanger. We ended up dragging the beast 2.5 miles out to the truck. 4 guys hooked up like sled dogs on a gang line. He went down at 8:15 am and was out of the woods at 2:30 pm. It was 2.5 miles in on a cross-country ski trail that was closed to ATVs. On another note: the next day I saw a timber wolf stride through the area, smelling the bloodline from the drag. A good-sized animal. He followed the drag-line we took out of the woods. 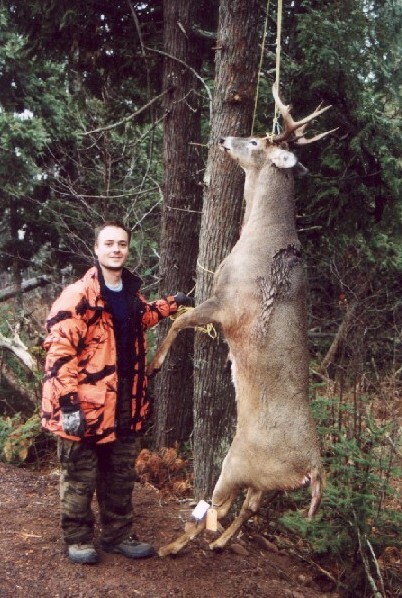 This was the third and biggest eight-pointer I took this season. This buck scored 111 1/8 net and with the G3 he’d push 130. The other two bucks came in at 62” and 102”.